The regathering has already begun. Since Israel gained statehood in 1947, the Jews have been making their way back. But during the Millennium, every single one will be restored to the Promised Land. /www.biblestudytools.com to be a usually reliable and helpful source. It was usually the task of women and children to gather wood for the fire, so it was natural for Isaiah to refer to women in this context. He is speaking of the desolation of Babylon, and the statement that follows is chilling. They have no understanding of God, His plan, or His ways. God will have no mercy upon them. He will show them no favor. They had chosen ignorance, rebellion, and persecution of Israel under Antichrist, and for those reasons God would show them no mercy. I was scanning a news article yesterday about what some college students at Berkeley in California think free speech really means. Their interpretation is that if anyone says anything contrary to the liberal agenda, then that shouldn’t be allowed. The reason? It hurts people’s feelings. However, if a left-leaning person says something that offends someone, that’s okay because it’s the truth, and people need to learn to accept it and quit arguing. In other words, choose ignorance and rebellion, and persecute those who get in your way. 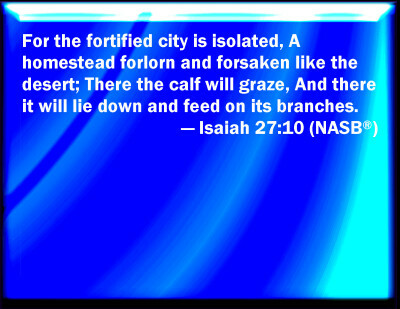 This verse is about the fortified city of Babylon, which had seemed impregnable. It will be destroyed, isolated. It will become the habitation of animals. Babylon the Great, the Beautiful City, the center of civilization, will be a lost place with no human habitation (Is. 13:19-22). Last Friday we looked at verse seven, which taught us that God will not spare those who oppressed Israel; and that although Israel was punished for her sins, especially the sin of worshiping false gods, she would be spared the severity that God visited upon her enemies. Now, in verse eight and nine, we see God’s mercy toward Israel. In measure enough to purge Israels sin, He has judged His people. Verse eight, when it shooteth forth, refers to the stroke of judgment of v. 7, which was for correction and not total destruction. God would debate or curb the stroke, knowing how much to give His people: and He will control His judgments on them like He would the rough wind in the day of the tempestuous and violent east wind, so that full damage will not be made on them. The east wind was always violent and rough in Judea (Job 27:21). By this judgment upon His people the iniquity of Jacob will be purged: and the proof of such cleansing from sin will be when Israel is caused by God to throw down the stones of the altar and the groves and throw away the images they had worshiped. Well, folks, we’re all still here. The world didn’t end today. I know, we still have three more hours, but I’m not in the least concerned. If you are a student of the events of the end times, you know that things are shaping up. Of course, people have been saying that since Jesus went back to heaven! But political affairs, the return of the Jews to national Israel, the alignment of the nations of the world, the move to a one-world government–so many other things, all are falling into place just as biblical prophecy said they would. BUT–I knew the world wouldn’t end today because some other things have to happen first. 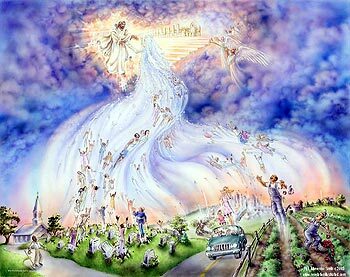 The Rapture, or “snatching away,” of the church–all believers from around the world, will take place. Then the seven years of Tribulation under Antichrist. Then the return of Jesus to the earth, the Millennial Kingdom, and the Battle of Armageddon, the final defeat of Satan, along with other details that I haven’t named. It isn’t time yet for the earth to be totally destroyed. So relax, would you please? Don’t sell all that you have and dress your family in white sheets. Don’t go stand on the highest hill you can find and wait for Jesus to come. It isn’t going to happen that way. We’re going to be going about our daily lives, and when the Rapture occurs, or the return of Jesus to the earth, no man knows. Not the day, not the hour. The subject of shame came up several times in my counseling office this week. People who are burdened beyond bearing with shame find it hard to function day by day. Guilt is what we should feel when we have sinned, hurt someone, entertained impure thoughts, rebelled against God. Shame is what we often feel about who we are. Shame is often something that was heaped upon us by others when we were growing up. If your parents told you that you were worthless, then you probably still feel the shame of those words. Any time someone else belittles us, we feel shame. The sad thing is that we often turn around and belittle someone else, and that’s because we’ve never learned who we really are. Four verses I use in my office may be helpful to you. Colossians 1:16 tell us that all things were made by God, for Himself. That includes you. You were made on purpose, just as you are, for God’s own fellowship and purpose. Ephesians 2:10 says that we are His workmanship (the Greek word is poema, masterpiece, literary work of art!) A poema is a thing of great beauty and value, treasured by the Maker. The same verse tells us we were created to do good works that were ordained for us before time began. Psalm 139: 14 says that we are fearfully and wonderfully made. We are miracles of God’s creation. The same passage tells us that He knew every detail about each one of us before we were ever conceived. Jeremiah 29:11 was, I know, in reference to Israel. However, we can understand and apply the principle. God thinks about each one of us; His thought toward us are of good, and not of evil. He has plans that will give us a hope and a future. If you are struggling with shame today, remember that you are the creation of God. If you are a born-again child of God, then you are the son or daughter of the King of Kings and Lord of Lords. There is nothing in you that is shameful. Sin is dealt with through confession, repentance, and seeking forgiveness. Our problem is that we know all these things on an intellectual level, but we do not appropriate them in our hearts. We are not humble before God when we fail Him; that lack of humility often leads to shame and guilt. I am 70, often feeling every minute of my years, but I get all excited still when I get to lead someone to Christ during my work day, or teach young people just starting out on a path I’ve long ago traveled. God is always good. All the time, even when circumstances aren’t good, He is good. God is Good, and Good is God. 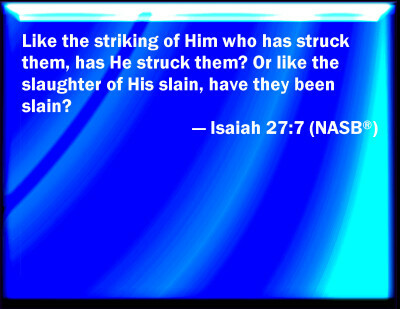 Isaiah 27:7. “Hath He smitten him, as He smote those that smote him? or is he slain according to the slaughter of them that are slain by Him? The pronouns in this verse could lead one to give up trying to figure out what it means. I’ve read several explanations. Amazingly enough, they all agree with each other! Has He (God) destroyed him (Jacob) in the same way He (God) destroyed Jacob’s enemies? Or is Jacob (Israel) dealt with in the same way as Jacob’s enemies have been slain? The answer? No. God’s wrath, poured out on Israel’s enemies, was not and will not be poured out in equal measure on Israel. He punished Israel for her sins, but He will redeem and restore Israel. Israel’s enemies will never be restored (Is. 63:1-5; Zech. 14; Mt. 25:31-46).